A plane carrying members of the Russian Kontinental Hockey Team called “Lokomotiv,” crashed today. So far 43 of the 45 passengers onboard died, with 26 year-old forward Alexander Galimov and one crew member in critical condition. Several well-known NHL hockey players were onboard, the most prominent being the Slovakian player Pavol Demitra, 36, an all-star right wing and former member of the Minnesota Wild, St. Louis Blues and Vancouver Canucks. Demitra had a whopping 304 career goals and 464 assists. 1994 Stanley Cup winning Rangers Defenseman Karel Rachůnek passed away on the flight as well. Also in the crash, Ruslan Salei (Detroit Red Wings), Karlis Skrastins (Florida Panthers, Dallas Stars), Josef Vasicek (Carolina Hurricanes, NY Islanders) and the promising 22 year-old prospect Alexandr Vasyunov, who played several games for the New Jersey Devils last year. Lokomotiv head coach Brad McCrimmon, 52, also played in the NHL for 18 years, winning a Stanley Cup in ’89 with the Calgary Flames. He served as an assistant coach for the Detroit Red Wings before working with Lokomotiv. The plane crashed north of Moscow, shortly after takeoff from the town the team is based out of, Yaroslavl, at Tunoshna Airport. It was on its way to Minsk. The championship-winning team was set to play in their first game of the season. 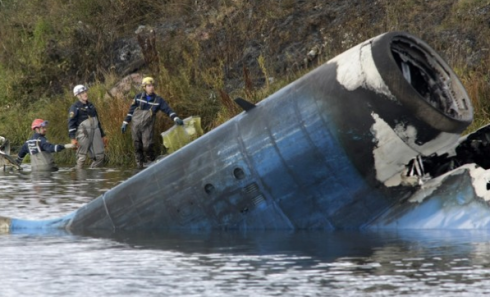 What exactly went wrong with the jet is still unclear, but it caught and fire and broke into pieces in the Volga River only 500 yards from the airport at around 5 a.m. Pacific Standard Time. Previous Previous post: Why Are Maroon 5 Touring With Train? ?